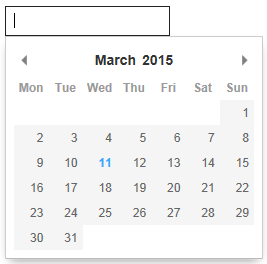 Here is how the calendar appears depending on how you configure it. 1. Extract the contents of the downloaded folder. 2. 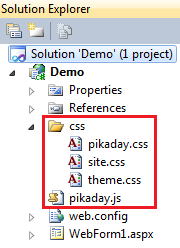 Copy and paste the following folder and js file in your asp.net project. Copy them to the root directory of your web application. 3. At this point your solution explorer should look as shown below. At this point, your webform should look as shown below. Hello! Sir how can i take only date('Dec 4 2015') instead of ('Fri Dec 4 2015')? Pls help..Thank You.